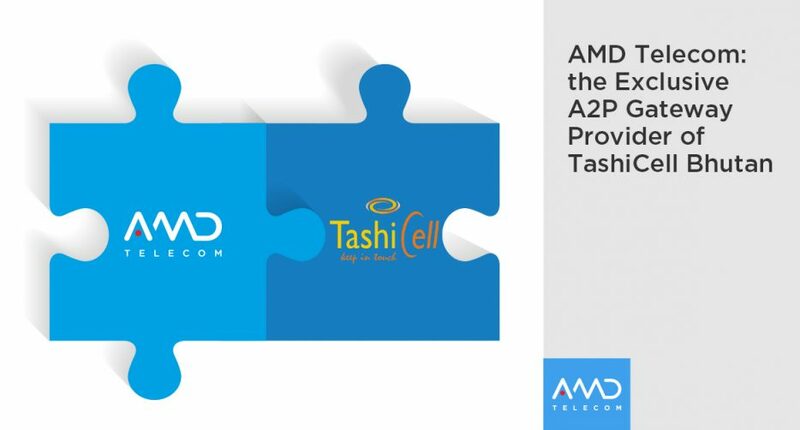 AMD Telecom is appointed TashiCell’s Bhutan exclusive A2P Provider — AMD Telecom S.A.
We are happy to announce that AMD Telecom is been appointed to fully manage Tashicell’s A2P Business with effective date 01 October 2018. Taschicell is now equipped with Intelligence Monitoring Systems to enforce its Security Line by protecting its subscribers from illegitimate transactions whilst enhancing Protected Messaging experience for its esteemed customers through a combination of AMD Telecom’s SMS firewall, SS7 firewall and A2P service analysis and management. The company was established in 2000 and incorporated in 2007 as AMD Telecom S.A. Today is counted among global market leaders in Open Connectivity solutions (SMS & Voice), SMS Monetization, Clearance & Settlement, Roaming services. AMD Telecom’s customers include Mobile Network Operators, Telecom Vendors, Social Networking Platforms, Global Email Providers and Global Resellers. The company operates offices in Greece, India, Italy, Peru, Russia, Spain and UAE. Tashi InfoComm Limited is the first private cellular company in Bhutan, a separate entity under Tashi Group of Companies. The company was incorporated on January 23, 2007, under the Companies Act of Kingdom of Bhutan 2000, after it won an international bid to operate as the second cellular operator in Bhutan. The company launched its GSM services on April 6, 2008, under the brand name “TashiCell”, with its registered office located at Norzin Lam, Thimphu. To find out more, click to download the press release.